“It gives me great pleasure to invite you again to the Kingdom Masters gala. Enjoy a great day out on Saturday 9th April.Once again we will be using Electronic timing for all events.Food will be provided to all who come to Tralee for the day. Looking forward to meeting you. Following the communication on Thursday 11th February regarding entries for the Arena European Masters Championships, LEN and the LOC wish to share the following update. Entries from 38 different countries across Europe for swimming reached the 14,000 individual race entries target in 50 hours, this is unprecedented with the previous record entry being 12,849 in Eindhoven in 2013 which took over six weeks to be achieved. This demonstrates the increased popularity of swimming across Europe. It is clear that a great many Masters athletes still want to enter these Championships. Following feedback from the community, LEN and the LOC agreed to review the planned operations for the Championships to identify any changes that would enable more entries to be accepted. In order to accommodate additional athletes, LEN have agreed that entries will re-open but a limit of three events per person will be in place (entries made previously will not be affected). The system is currently being updated to enable additional entries to be made. LEN anticipate that the system will be ready and entries will open on Thursday 18th February after midday. LEN and the LOC will issue a communication when the system is fully open for swimming entries, including relays. Until entries close the detailed schedule of events each day will not be known. If the numbers increase significantly over than 15,000, both 50m pools in the London Aquatics Centre will have to be utilised for competition (whilst ensuring that there is warm up capacity at specific times in the day). LEN will issue the final programme once start lists have been confirmed. LEN and the LOC understand the great lengths to which the Masters community have gone to ahead of the Championships – training for the competition and booking flights and accommodation– and we thank you for your patience as we reviewed the situation. Diving and synchronised swimming entries remain open for athletes to enter. In case you haven’t heard the Europeans started a minor Masters war by closing entries after just over 48 hours but with 14000 swims entered. So far I have heard of 83 Irish swimmers that managed to get their entry in but lots were disappointed. Some had even paid for flights and accommodation. I haven’t heard that any relays managed to get entered. I’ve also included info on the upcoming Ulster Masters to be held on 17th April in the new Newry pool. Please note that the 1500 is limited to 2 heats an a first come first served basis!! For clubs who have the facility I’ve included the Hytek file. Finally the Masters Committee have organised a training session for the development squad and other swimmers travelling to the GB or European Masters this summer on Saturday 27th February in the NAC. Start time: Registration at 4pm Finish time: 8pmSchedule includes dry land session, nutrition workshop hosted by Gourmet Fuel and 1 hour long course swim session. Contact Aisling McKeever LSO@swimireland.ieif you want to go. If your not in training for the European/GB Masters then this maybe of some interest to you. 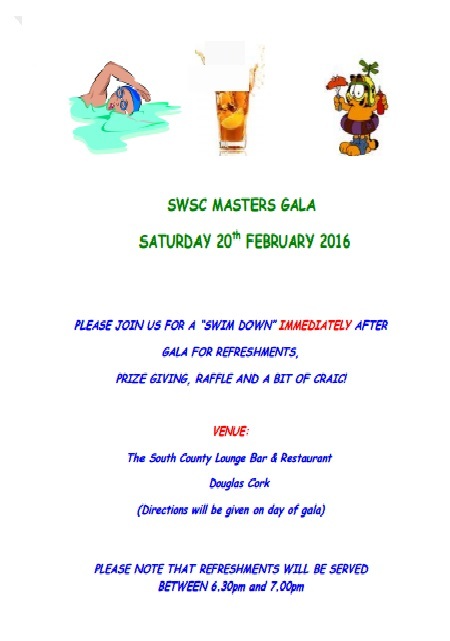 Cormorant SC have added some Masters events to their upcoming gala, please see attached. The closing date is next Wednesday. P.S. Masters records cannot be broken at this gala as there is a shorter lane in the pool. It’s great to be back. I can only apologise for the fact that I haven’t posted in a long long time but we decided to sell handbags and shoes and then redirect you to some federal site to declare goods. (Basically we were hacked!). Anyhoo, thanks to pretty much everyone, we are back up on and running. I look forward to posting all new and exciting things about masters swimming this year! March many weathers . . . The first day of Spring . . .